Station Eleven meets The Martian in this brilliantly inventive novel about three astronauts training for the first-ever mission to Mars, an experience that will push the boundary between real and unreal, test their relationships, and leave each of them and their families changed forever. In an age of space exploration, we search to find ourselves. In four years, aerospace giant Prime Space will put the first humans on Mars. Helen Kane, Yoshihiro Tanaka, and Sergei Kuznetsov must prove they re the crew for the historic voyage by spending seventeen months in the most realistic simulation ever created. Constantly observed by Prime Space's team of "Obbers," Helen, Yoshi, and Sergei must appear ever in control. But as their surreal pantomime progresses, each soon realizes that the complications of inner space are no less fraught than those of outer space. The borders between what is real and unreal begin to blur, and each astronaut is forced to confront demons past and present, even as they struggle to navigate their increasingly claustrophobic quarters and each other. 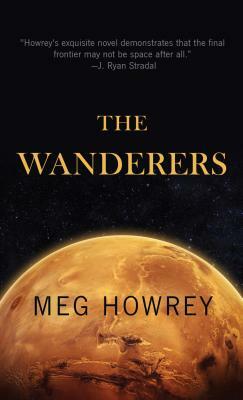 Astonishingly imaginative, tenderly comedic, and unerringly wise, The Wanderers explores the differences between those who go and those who stay, telling a story about the desire behind all exploration: the longing for discovery and the great search to understand the human heart. Library Journal, A Big Fiction pick for March 2017. Meg Howrey is a former dancer who performed with The Joffrey, Eglevsky Ballet, and City Ballet of Los Angeles. She is the author of two previous novels, Blind SightandThe Cranes Dance, and the coauthor of the bestselling novels City of Dark Magic, and City of Lost Dreams, published under the pen name Magnus Flyte. Her non-fiction has appeared inVogue and The Los Angeles Review of Books. She currently lives in Los Angeles."